We all know it's important to have good connections. But I'm not just thinking about the kind that help you get ahead in life. I'm talking about the simple act of sharing good things with good people and feeling a connection. Good food is a big part of that for me. Speaking of which, a childhood friend, Mr. Hollywood, passed through Prague last week. He was staying at the Hotel Josef. When he suggested dinner, very quickly, I knew where we should eat. 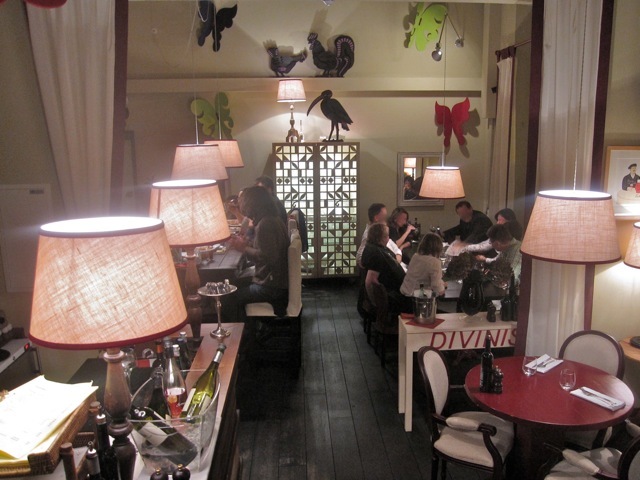 "Let's try an Italian place called Divinis," I said. "I've always wanted to eat there, it's run by a famous TV chef, I've heard good things about the cooking, and it's a two minute walk from where you are staying." The deal was sealed. 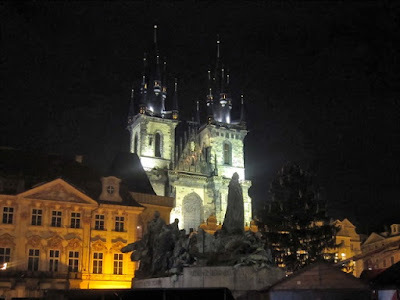 I made my way there, walking through Old Town Square on a chilled, misty evening, enjoying, as always, the night view of the Týn Church. 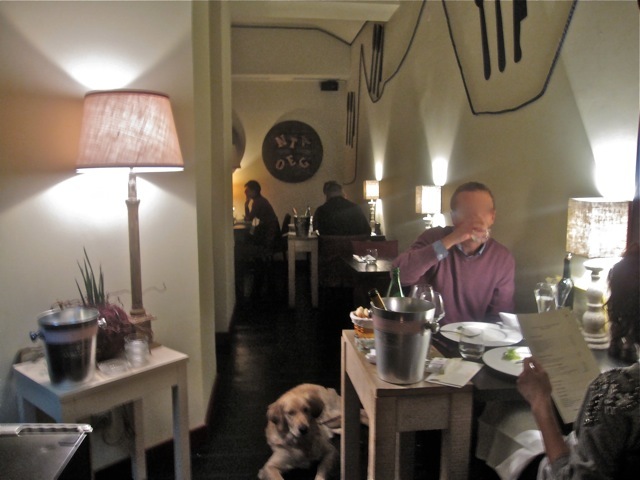 The star cook and owner, Zdeněk Pohlreich, recently changed and expanded the interior. Still, it's not a big restaurant. I'd describe the interior as chaotic-eclectic-rustic. Along with the brightly colored butterflies and roosters, there are dark wood-planked floors, homey lampshades and bookcases with books, bottles of wine, and magazines. Some tables are quite cozy, but with something of a family dinner feeling. My friend, a dog lover, was pleasantly surprised to see that canines are welcome. But some tables are awkwardly placed near the kitchen or the front door. We were lucky and received one by a wall in the front room. 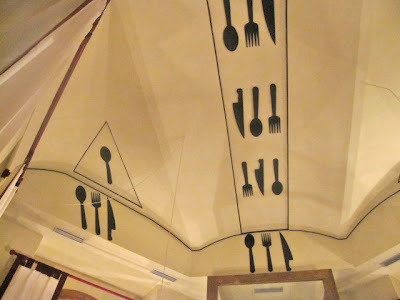 The forks, knives, and spoons on the ceiling are an interesting design touch. 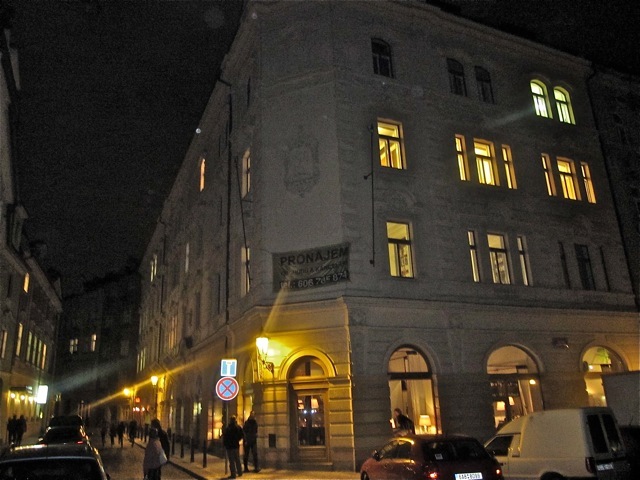 In a rave review from last year in the now-defunct Prague Spoon, some commenters complained about the service. We found it generally good, efficient and friendly. The only issue would be that our waiter had trouble answering my friend's questions in English about the menu. The one-page document is quite terse in its descriptions. 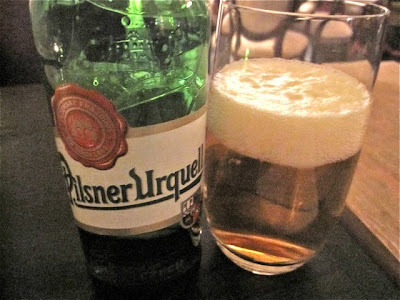 While we talked and caught up on life, I had a .33 liter bottle of Pilsner Urquell (65 CZK). Mr. Hollywood had a .15 liter glass of red wine from the Vertigo winery (130 CZK) that the waiter suggested and he was satisfied with. 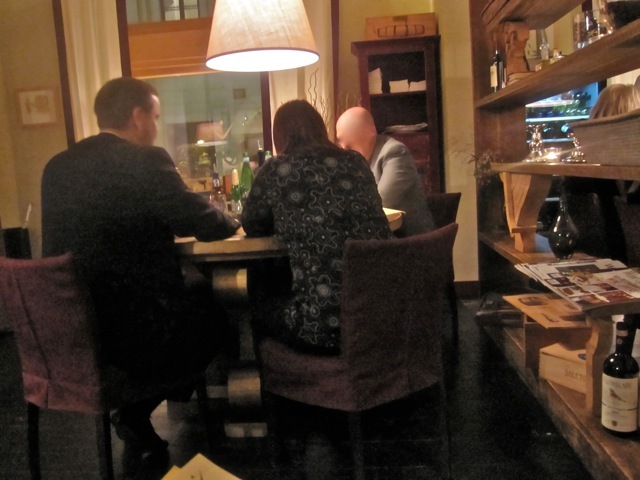 For a starter, I went for the warm octopus salad (265 CZK). I wouldn't describe it as a salad, but I thought it was incredibly good. The tentacles were impossibly light and tender, almost scallop-like. 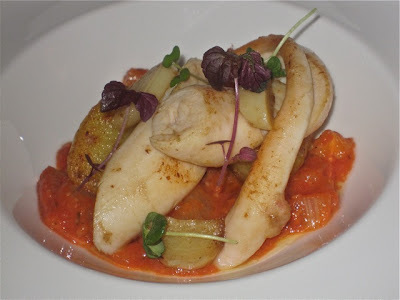 Of all the octopuses I've had in my life, I've never had anything quite like it. I'd love to know the cooking method that achieved that texture. It sat atop potatoes, terrifically intense tomatoes, and baked fennel that gave the dish a light anise flavor. 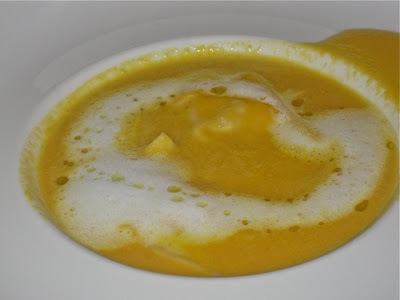 Mr. Hollywood got one of the specials, a pumpkin soup with lobster ravioli (190 CZK). He called it hearty, yet delicate. He was impressed with the flavor of the lobster in the pouches of pasta. We wanted a bottle of wine with our meal. 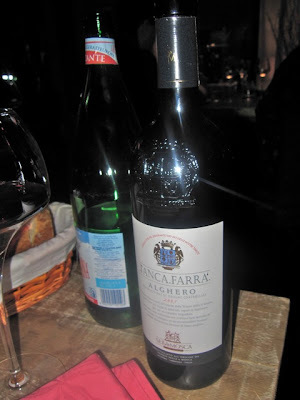 I selected the 2005 Sella & Mosca Tanca Farra Alghero from Sardinia (660 CZK). It was one of the less expensive wines on offer. I'd enjoyed a bottle of the 2004 from the same winery at Ichusa Botega & Bistro. That bottle was 77 CZK cheaper. We also had a liter bottle of Lauretana mineral water (115 CZK). 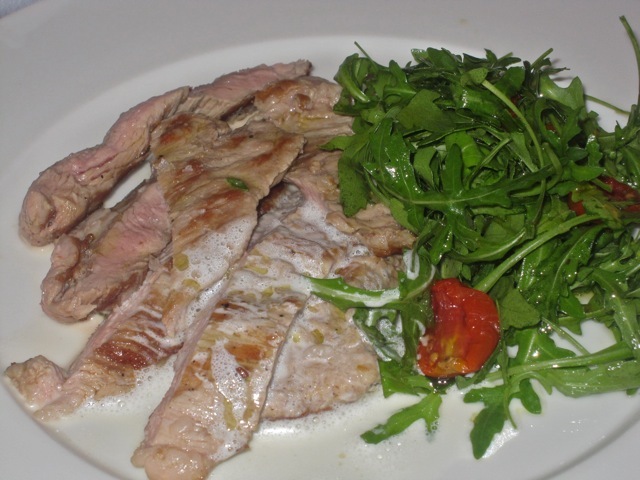 For a main course, Mr. Hollywood ordered the veal tagliata with parmesan sauce and rucola (395 CZK). He was told it was normally cooked medium, but that was not to his taste, so he asked for it done medium-well. When it was delivered, he felt it was still too pink for him and asked for it to be cooked a bit more. The dish was whisked away and returned quickly after a few more minutes on the stove. Mr. Hollywood said the meat was tender, with a mildly sweet flavor that paired well with our wine. 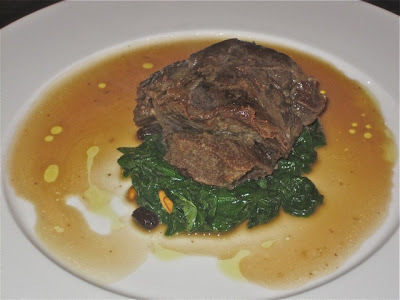 I went for the braised veal cheeks with Marsala wine (395 CZK). The succulent, fork-tender meat had a seductive simplicity to it. Each buttery bite was a pleasure. It was served over fresh-wilted spinach. I only wished for a stronger shot of the Marsala in the juices underneath and more raisins and pine nuts. 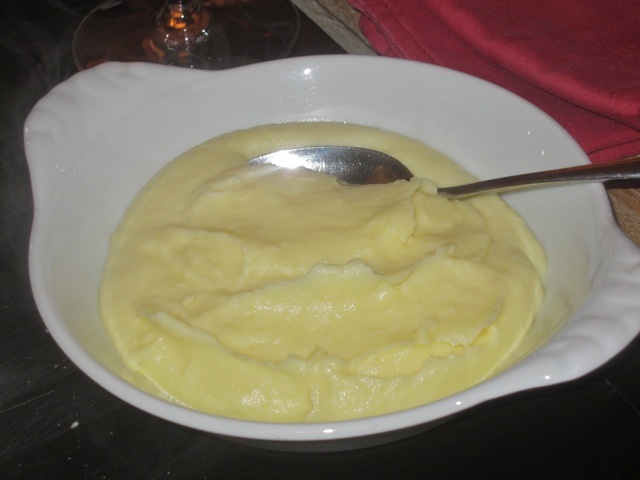 The waiter suggested a side of mashed potatoes (80 CZK). It was super-rich, decadent and creamy. For comparison, I'd say that I only liked the mushroom-flecked mashed potatoes at La Gare slightly more. 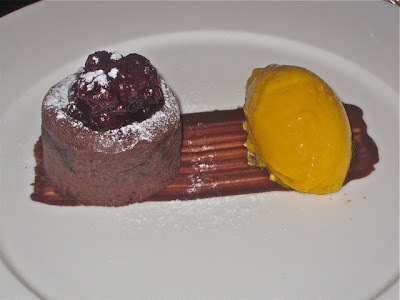 Speaking of comparisons, I've occasionally come under criticism for always selecting chocolate desserts. My rationale for doing this has two components. First, given my extensive experience in this area, I do consider myself perhaps the foremost expert on the chocolate fondants of Prague. Achieving this level of knowledge requires a singularity of focus and purpose. Second, there are few desserts I'd rather have. So, at this dinner, I carefully scanned the menu and duly considered each dessert. Then I ordered the chocolate fondant (180 CZK). For those who care about such esoteric things, this was one of the best out there. The fresh-baked, delicate little cake was topped with a dark berry compote. A poke with a fork released a torrent of some of the most intense, thick chocolate you'll find. To add to the pleasure, there was an intense, sweet-sour mango sorbet on the side. It was frozen, and yet it was smooth and could be scooped up on the spoon like a pudding. Another miracle of texture from the kitchen. We finished off the meal with a cafe latte (65 CZK) and a cappuccino (65 CZK). 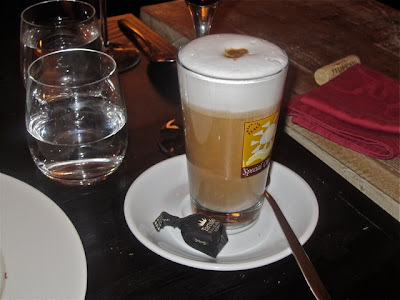 The bill totaled 2605 CZK before tip, which is by no means cheap. But there are far more expensive restaurants in Prague, and it was one of the more enjoyable meals I'd had in a long while. Mr. Hollywood, a veteran of the LA dining scene, was also very pleased. 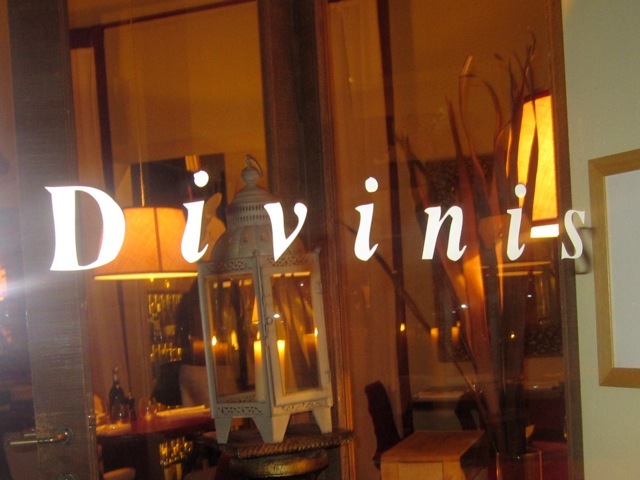 He thought Divinis Wine Bar was a good value compared to restaurants back home. 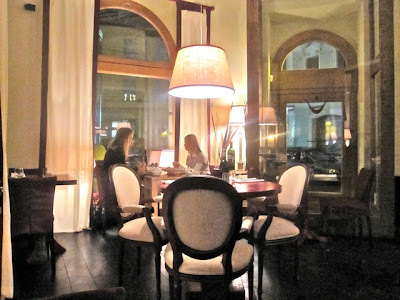 I'm not going to spend that kind of money on a regular basis, but based on this experience, I'm adding this restaurant to the recommended list I keep in my head. In the end, we both agreed: Divinis connects.